Online trading of hoarding boards, Indication board, Billboard. As we step outside our homes, we come across various hoarding boards that are put up by several companies who want to promote their business. These outdoor hoardings are considered as the most relevant form of communication with a consumer, who may or may not be interested in a particular brand's products. The modern day hoarding boards have evolved from mere posters that were painted on sheets or clothes that were hung roadsides and outdoors to inform the commuters about something. Now, the same concept has been modernized and made more popular, courtesy the inclusion of the technology that ensures a complete engagement from the consumer side. Online trading of hoarding boards is now even simpler because of various media and advertising companies providing these services at competent prices. This makes it completely simple for a business owner to approach them for their specific advertising requirements. The hoardings or billboards are more than just a canvas portraying some information. To businesses, it is one of the most crucial method of reaching out to their possible customers. By using this medium in everyday life, the brands are now possible to interact with its customer live whenever they are outside from the home. Be it a simple signage, medium size hoarding or a huge board, a business owner can choose from a wide variety of options to publicize its services. For businesses who are on the outlook of online hoarding boards, you must make sure that the advertising companies that you are scanning provide an array of out of home advertising mediums. Since the boards can be displayed almost anywhere outdoors, a business must look into the potential mediums that have a higher level of interaction with people on a routinely basis. For example, transit options such as buses, railways, cabs are a necessary transport option that people use every day. So this OOH advertising option for hoarding board must be considered. Similarly, the street furniture such as bus stops, subway stands, mall cabins etc. are also regularly used by people, hence they are equally good from the advertisement point of view. 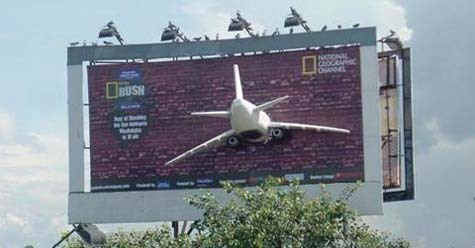 How offbeat OOH advertising can help you..?